Six men have been charged over an illegal Easter parade in Co Armagh. Police moved in to prevent masked men wearing paramilitary-style uniforms staging an event in Lurgan on Saturday. There were minor skirmishes as officers made nine arrests. A woman was injured and taken to hospital. Five men aged 48, 39, 36 and two aged 30 have been charged with offences linked to the procession. A sixth man aged 28 also faces three charges of assault on police. The march is understood to have been organised by Republican Sinn Fein. Police said a seventh man was charged with two counts of obstructing police and assault on police. Two others, including a 47-year-old arrested on suspicion of organising the parade, have been released on bail pending further police enquiries. 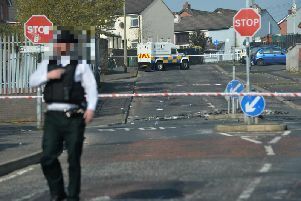 It is understood six of the men arrested were not from the Lurgan area. Speaking on Saturday, PSNI chief inspector Jon Burrows said: "The police have attempted to engage with members of this group advising them to comply with their legal responsibilities in relation to processions."